Traditional Crowdfunding has been around for quite some time now, but of late, it is not the only crowdfunding method; Cryptocurrency has become all the hype these days, and with good reason. ICOs (Initial Coin Offerings) are becoming a successful and more convenient method for startups to raise funds from online investors. CoinIgniter, as the name indicates, is the platform that enables startups to create their own tokens without having to write a single line of code. It lets Entrepreneurs, Artists and Innovators offer investors some units of a new Cryptocurrency that they create themselves in exchange for Ethereum. CoinIginter understands the complications and difficulties that startups have to face when raising funds, and aims to make this process as simple and hassle free as possible. With CoinIgniter, this whole process is a breeze. You can have your own token deployed in 5 easy steps. Create a token and choose a name and symbol for it. Upload a White Paper that explains the business model of the project. Tell your story in crisp free images, text and videos. Deploy your SmartToken with a click of the mouse. Promote your ICO website to raise funds. 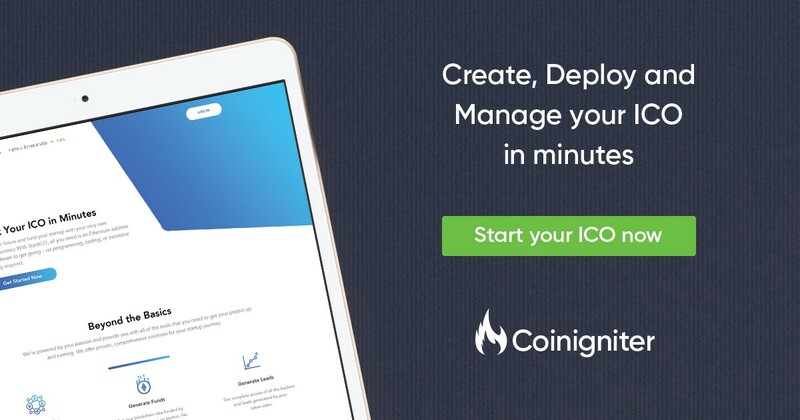 CoinIgniter will also provide you a landing page for your ICO with built-in social media marketing tools that can be used to promote your ICO and engage with your contributors. When the ICO is deployed, Flex funding option will be used which is the preferred campaign funding option. CoinIgniter is live and is ready to to deploy your tokens on Main Ethereum network. Visit https://www.coinigniter.io to launch your ICO in minutes.